Origins of Mathematical Abilities. What a Number Is: Mathematical Foundations and Developing Number Concepts (K.F. Miller). Relationships Children Construct Among English Number Words, Multiunit Base-Ten Blocks, and Written Multidigit Addition (K.C. Fuson, J.L. Fraivillig, B.H. Burghardt). Understanding Elementary Mathematics (J. Bisanz, J.-A. LeFevre). Mathematical Misunderstandings: Qualitative Reasoning About Quantitative Problems (R.E. Mayer, A. Bovenmyer Lewis, M. Hegarty). The Role of Expertise in Solving Arithmetic and Algebra Word Problems by Analogy (L.R. Novick). 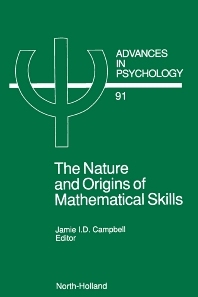 The Development of Skill in Mental Arithmetic: An Individual Differences Perspective (K.F. Widaman, T.D. Little). Numerical Cognition: Representation, Process, and Architecture. A Theory of Enumeration that Grows Out of a General Theory of Vision: Subitizing, Counting, and FINSTs (L.M. Trick). Working Memory, Automaticity, and Problem Difficulty (M.H. Ashcraft et al.). Representation and Retrieval of Arithmetic Facts: A Network-Interference Model and Simulation (J.I.D. Campbell, M. Oliphant). MATHNET: Preliminary Results from a Distributed Model of Arithmetic Fact Retrieval (M. McCloskey, A.M. Lindemann). Inhibitory Mechanisms in Normal and Dysfunctional Number Processing (J.M. Clark). Cognitive Number Processing: An Encoding-Complex Perspective (J.I.D. Campbell, J.M. Clark). The Functional Architecture of Numerical Processing Mechanisms: Defending the Modular Model (M. McCloskey, P. Macaruso, T. Whetstone). In Defense of the Encoding-complex Approach: Reply to McCloskey, Macaruso, & Whetstone (J.I.D. Campbell). Author Index. Subject Index. A broad range of current experimental research on numerical cognition and the acquisition of mathematical skills is covered in this volume. The individual chapters provide in-depth analysis of specific issues, methodologies, phenomena, and theory. The book is divided into two parts. In the first part the focus is on the acquisition and development of numerical skills. Part 2 of the book contains research on the information-processing basis of numerical skills, focusing on the mechanisms of perception, attention, and memory that support number skills. The range of theoretical and methodological orientations represented in the volume captures both the diversity and coherence of contemporary research into mathematical skills. The research of educational psychologists, cognitive psychologists, and cognitive neuropsychologists mutually informs and reinforces theoretical developments within each area. The multidisciplinary interest in mathematics skills reflects the pervasiveness and importance of mathematics in education, technology, and science, and also indicates that questions about mathematical competence address important issues in diverse areas of psychology and cognitive science.